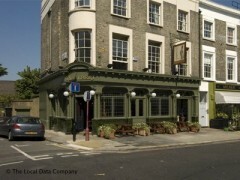 About: The Albert is a pub with a large beer garden that serves modern British dishes from a varied menu. There is a non smoking area in the conservatory. They also cater for children. Catering for private parties is available upon request. Please phone for details. "Unfussy and relaxed pub in upmarket Primrose Hill"
Do you think Primrose Hill has nothing but fancy boozers with rude staff a la Engineer? If so, you’ll be pleased to know The Albert has none of its neighbours’ gnarly attitude. It’s a far cry from its posey neighbour, where you’ll get scolded by staff for daring to glance around looking for a table, as they are always fully booked, naturally. The Albert attracts a local, mostly mature, 30+ crowd, who come for the Greene King beers and ales on draught. There is a wine list that will please most palates - as long as you’re happy with New World choices - and food, which is pub fare bordering on gastro-pubby. There is free Wi-Fi for customers and plenty of outdoor seating, both in the beer garden and on the pavement outside. Its attractive, old fashioned exterior carries on in the décor within, as if the management couldn’t be bothered to tart the place up. Beside its uber-relaxed atmosphere, it’s the pavement seating that draws people here, offering the possibility to spy on the well-heeled locals (David Milliband lives just around the corner). In the winter the pub attracts a healthy crowd during quiz nights, but it never gets too packed, even at weekends, despite being located on a straight path from Regent’s Park.